Knead a bit of Ochre Fimo into white Sculpey until a pie-crust color is attained. Roll a small ball and press into pie tin (as you would with a real pie). 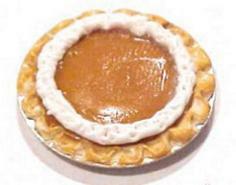 With X-acto knife, trim any excess from the rim of pie tin. Cut the point off a toothpick, and use this to flute the edges of your pie. Bake pie in oven at 250 degrees for 10 minutes. With X-acto Knife, shave a bit of Ochre Artist's chalk into a powder. With thumb, rub this powder around the fluted edge of pie for a "baked" look. Then paint edge with Fimo Matte lacquer. For filling, knead together one part Ochre to one part Orange Fimo. Roll a small ball and press into pie crust until even and flat. For whipped cream, roll a very thin snake of white Sculpey and place this around the edge of the pumpkin filling. To texture, make triangular indentations in the snake with the flat side of the very tip of your X-acto knife. Bake entire pie again at 250 degrees for 10 minutes. NOTE: For colonial pumpkin pie, spray the pie tin black and leave off the whipped cream.